Numerous people across the state will visit the emergency room annually for help due to slip-and-fall accidents. Some injuries will not be serious and after some quick treatment they’ll be on their way will not result in a hospital stay. However, other injuries can be severe such as fractures, breaks or even a fatality. 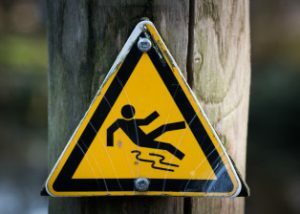 Hundreds of slip-and-fall accidents can take a financial toll on the victim and his or her family. The most common reasons for this accident are the condition of surfaces and the lack of job training at the businesses. Slip-and-fall accidents happen when the walking surfaces are left in an unsafe condition, like with water or other liquids. This is because of failure to maintain the surface, like removing the hazard timely. The surface can also be unsafe due to the weather, such as tracked-in snow. Even an attempt to do the right thing, like keep floors clean, can result in an accident. When signs are not posted to notify guests that the floor is slippery a dangerous accident can occur. A walking surface that is not level is also cause for concern. Carpeting that is fraying or cracks and potholes can cause a slip-and-fall accident. The law mandates that property owners keep their land safe for guests who are invited onto the property. This means clearing any potential dangers.